Save big on Black Friday weekend (US residents only). 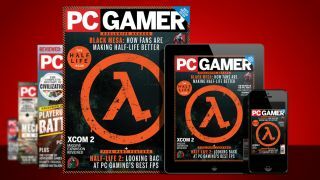 This weekend you can get a PC Gamer US or Maximum PC print subscription for an extra 20% off. All you have to do is head to the page, add it to your basket, then apply the code 20NOV to see the appropriate price. This is one of our lowest prices all year, and in exchange you'll get 13 issues of the magazine of your choice sent to your door. US residents can get each for $19.20. Alternatively, if you prefer to read digitally, you can get 20% off a subscription that way too, and have the magazine on your phone or tablet. Get the best in PC games writing or hardware writing in the way you want it, every single month.